The classical guitar is a fretted instrument fitted with six nylon strings tuned to E A D G B E. (Note: this is the normal tuning for the classical guitar) The instrument is played with the fingers and fingernails. The fingernails should be trimmed and shaped correctly to get the best sound from the instrument. Because of the great range and variety of tone, the classical guitar is an ideal instrument for the solo performer. This is also possibly one of the reasons why the classical guitar is such a popular instrument. Douglas Back is a performer and teacher of the Classic Guitar. For more information Click here to go to the Douglas Back website. Roland Gallery is a performer and teacher of the Classical Guitar. For more information Click here to go to the Roland Gallery web pages, on this website. Gary Ryan is a performer and teacher of the Classic Guitar. For more information Click here to go to the Gary Ryan website. Elias Sibley is a performer and teacher of the Classic Guitar. For more information Click here to go to the classical guitar webpage on Elias Sibley's website. 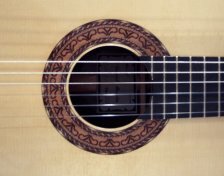 For information about other outstanding Classical Guitar performers, Click here or go to the Guitar Links page on this website. 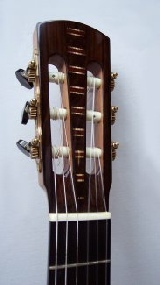 For more information about playing and tuning the classical guitar, also books and CDs etc. Click here or go to the Classical Guitar Links page on this website.